I already had Elegant Eggplant cardstock and copper embossing powder out on my work table, so I decided to use them with the Helping Me Grow stamp set for this card. Helping Me Grow Stamp set meets copper and bleach! There are so many images I like in this 15stamp set (yes - 15!). I love the floral images (it was hard for me to choose between this one and the other floral image (I'm not going to show my botanical ignorance by trying to name the flower!) but I was also really attracted to the versatility of the label outline (that coordinates with the die in the Rose Garden Thinlits set) and the artistic little corners and useful greetings. I heat embossed the floral image onto Elegant Eggplant cardstock with copper embossing powder. Then I applied bleach, with a fine but not greatly valued brush, to the petals and stalks. I applied more bleach to some areas than others to add some dimension to the image. The areas with more bleach now look pink. Once the bleach was dry, I used an Early Espresso Stampin' Write marker to shade the stems and the centres of some petals. I also copper heat embossed two of the corners. I didn't use any bleach on these but added some of the Early Espresso with the marker just towards the right angle. I put the label image onto my acrylic block and could fit the word stamp into the middle, so I knew it was centred and it needed only one step to stamp both the outline and the sentiment with Versamark onto Tip Top Taupe cardstock. I then heat embossed with copper embossing powder and cut out the label with the matching thinlit from the Rose Garden set. 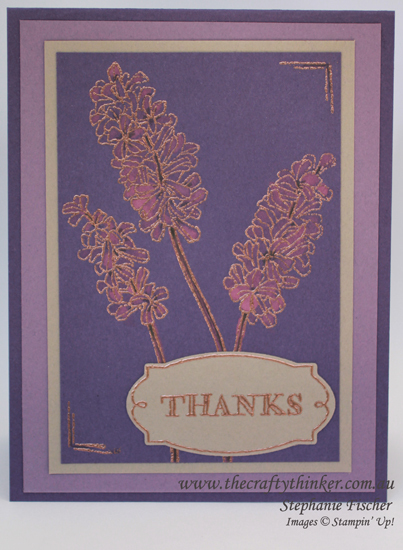 The card base is Elegant Eggplant, layered with Perfect Plum and Tip Top Taupe, then the decorated panel. Thanks for visiting, 'til next time!